Wonderful release. 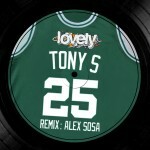 LVR#025#INTERIM FUNK#Tony S, Remix: Alex Sosa. The closest to the DeepHouse. We are delighted with this magnificent sound by Tony S. But put aside the work of Alex Sosa on the remix.Very complete release in reference 4, the label.